The Center for Families, Children & the Courts (CFCC) publishes many written materials for a diverse audience of judges, professionals, and court users. These publications include research briefings, statistical updates, informational pamphlets, and more. Browse these publications by subject area below. ¿Qué Sucede en la Corte? This guide is a compilation of many state and national programs that have been developed and designed to promote permanency for foster care children. Many of the program descriptions and resources found in the guide address the specific challenges to permanency that local courts have identified. The guide has been updated to include many state and national promising practices and model programs that courts and agencies have used successfully to promote permanency for children, as well as to address identified obstacles to permanency. Many of these programs are collaborative and involve local courts, public and private agencies, CASA, as well as other service providers. The guide has been reorganized to highlight specific themes and programs and to provide an easy reference for each local court system. NOTE: The supplement is over 400 pages, so if you would prefer printing only a particular section, please use the Table of Contents below to find and print only the area in which you are interested. To receive a hard copy please contact CFCC. Hold an Adoption Saturday in the month of November. Plan and schedule several permanency events throughout the year, such as providing a child with a commemorative item, for example a teddy bear, at the finalization of his or her adoption or setting a time in the morning that will allow anyone wanting to finalize an adoption to take priority on the court calendar. Coordinate a working group of practitioners to strategize about how to launch any of the innovative, permanency-based model programs in this guide that are not being used in your local county. Convene a stakeholders meeting to develop and bring about complete systemic change in the area of permanency. Serve as a resource as issues arise. Click Here to continue to the child support main page. These videos developed for children, by Court for Kids, a program of the Marin County Superior Court, explain the purpose of court, what to expect, and who does what in the courtroom. Mediation and child custody recommending counseling is a process in which a neutral, specially trained professional will listen to the parents concerns and help them develop a parenting plan that meets the needs of their family in the event of a divorce or when two parents choose to live apart. This video describes the mediation and child custody recommending counseling court process, provides helpful information about parenting plans, and offers tips on how parents can reduce conflict and help their children adjust to the changes happening in their family. Together Again: A Day of Celebration This book, written from a child’s perspective, seeks to describe the challenges that face children and families going through the dependency process, and celebrate the important accomplishments of parents and the professionals that support them in their efforts toward reunification. The book also includes a “Certificate of Reunification” to commemorate the date of reunification. Printable versions are available below. What's Happening in Court? An Activity Book for Children Who Are Going to Court in California, available in English and Spanish. This book is for children coming to court — whether they are witnesses, visitors, or involved in a case. It introduces children to the court processes in which they are or could be involved, the people who work in the judicial system, and the vocabulary that surrounds judicial proceedings. It is meant to be used as a teaching tool that may foster conversations between children and adults about the court system, and a game book that gives children who are in court something to do while they wait. Click here to continue to the California Collaborative Justice Courts main page for additional information. Drug court participants had significantly lower rates of recidivism than the comparison group (29% vs. 41%). Graduates of the drug court program had even lower rates of recidivism (17%). The nine drug courts showed savings ranging from $3,200 to $20,000 per participant. The study showed over $9 million in savings for the state for a group of 900 participants. This study describes the development of the various collaborative courts in California since their inception in the 1980's. This is a directory of CASA offices by county. CFCC is involved in many juvenile delinquency projects aimed at improving the juvenile justice system. As a result, CFCC produces publications and other resources to provide information to court professionals, justice partners, and the public. Juvenile Delinquency publications can be found on the Juvenile Delinquency page. CFCC is involved in many projects aimed assisting courts hearing dependency cases. Staff provide technical assistance, legal information, training, and education to judges, attorneys, and system partners. Staff also produces publications and other resources for both professionals and court users. To access the publications and program information visit the Juvenile Dependency page. 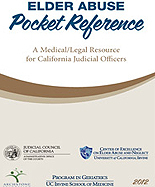 This guide describes the dependency court process in California. It also includes the story of one parent who went through the dependency system and her advice to you on how to get your children back home. The Guide to Dependency Court has more information on what happens to juvenile custody orders when your case is over. More resources can be found on the Juvenile Dependency page. Preparing Court-Based Child Custody Mediation Services for the Future (Report 12) (2000). Visitation with Children: A Follow-up of Court Mediation Clients,Report 5 (1994). Mediated Agreements on Child Custody and Visitation, Report 4(1994). Client Evaluations of Mediation Services: The Impact of Case Characteristics and Mediation Services Models, Report 3 (1994). Client Evaluations of Mediation Services: Perspectives of Mothers and Fathers, Report 2. (1994). Overview: California Family Court Services Mediation 1991: Families, Cases, and Client Feedback (Report 1) (1992). Access to Visitation Grant Program Annual Reports to the California LegislaturePursuant to Family Code section 3204(d), the Judicial Council shall, on March 1, 2002, and the first day of March each subsequent even-numbered year, report to the Legislature on the programs funded and whether and to what extent those programs are achieving the goal of promoting and encouraging healthy parent and child relationships between non-custodial or joint custodial parents and their children while ensuring the health, safety, and welfare of children, and other goals described in this chapter. The first published report to the Legislature that provided an overview of the grant program and its accomplishments. Although no recommendations are made in the report, the following actions to improve parents access to and visitation with their children were highlighted as deserving the Legislature's consideration: (1) mandatory training and education for SV providers; (2) expansion of A/V to non-existing counties; (3) recognition of A/V grant-related services as an essential court-based service; and (4) addressing the inadequacy of funding. Provides information on overall program administration, review and selection processes, and reporting requirements. Although no specific recommendations are made in the report, the report highlights one major challenge—the need to identify adequate, stable funding resources for programs to meet the increasing demands of the courts and parents struggling with access to visitation issues. Provides the state Legislature with details on the grant programs, the scope of these programs’ services, and the development and implementation of the new state Access to Visitation Grant Program Data Collection and Reporting System, which took effect October 1, 2003. Although no formal recommendations are made in the report, it identifies a major challenge that warrants the Legislature’s consideration—maintaining and expanding services despite the impediment of inadequate funding. It also identified three next steps for the grant program: (1) conduct a statewide needs assessment; (2) evaluate the data collection system that was created; and (3) identify effective models of practice. Provides an overview on the grant-related achievements supported and administered by the courts and their collaborative, community-based subcontractors. In addition, it highlights program service accomplishments and general provisions of service delivery. Provides general information on the programs funded for the fiscal year. To enhance court and community outreach while also reinforcing the goals of information sharing and maximal use of program resources to meet the needs of the courts and families receiving grant-funded services, the grant program proposes to spend fiscal years 2005–2006 and 2006–2007 focused on the following goals and activities: (1) providing technical assistance and offering training and education to courts statewide; (2) using the research findings from the programs’ data collection and reporting system to create a profile of the demographic population characteristics of families receiving A/V services; (3) developing a A/V Program Resources Binder; (4) developing an informational directory of statewide SV service providers; and (5) identifying model programs that can be replicated on both state and national levels. Highlights the total number of clients served for fiscal year 2005-2006 and how the courts and their subcontractors are promoting and encouraging healthy parent and child relationships through the grant-related services. Although no specific recommendations are made in the report, programmatically, the greatest challenge and statewide need continues to be adequate funding to meet essential court-related services. The report highlights that to assist the courts, program administrators, program constituents, and the Legislature in evaluating future policy decisions, the first in a series of future statistical data reports will be reported regarding the AV Data Collection and Reporting System. In fiscal year 2008, a demographic profile of the characteristics of families receiving services will be provided. The grant program celebrated its 10-year anniversary in fiscal year 2006–2007. The report showcases programs funded, program successes and accomplishments, innovative promising practices, and program service delivery gaps and challenges. Although no formal recommendations are made in the report, it does identify various challenges and complexities regarding the administration and operation of the grant-related services that limit the ability of the grants to address the great demand for program services.